Hospitality is a glamorous and alluring industry with equal and endless opportunities on global level. The need of enhanced experience in regards to accommodation, meals and hospitality is constantly the pushing the demands high for skilled professionals. Together the demand and supply of professionals is making the hospitality industry more challenging and dynamic day by day. In result, the need of strong qualification background in hospitality has become a key requirement to start career in hospitality industry. 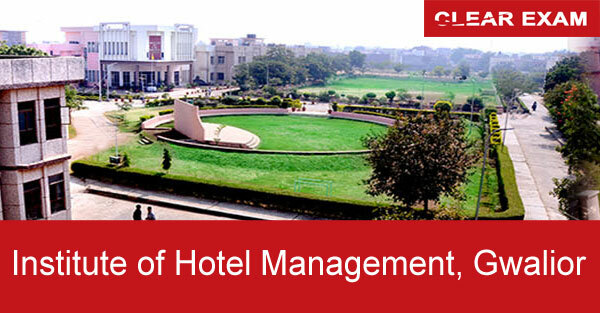 To make the qualification background strong for hospitality industry, Institutes of Hotel Management across the country are considered a great platform. One such platform, which can help students in laying strong foundation of hospitality career is Institute of Hotel Management, Gwalior. The course of Bachelor of Science is a three year graduation course. National Council for Hotel Management and catering Technology conducts the entrance exam called NCHM JEE for admission in college. The exam is conducted in the month of April in offline mode. Students appearing for exam are required to fill the application form which is available in both online and offline mode. The form needs to be submitted by registered post/ speed post at NCHMCT Noida office. The admit card for the exam is available in online mode only and students are required to carry 2 copy of admit card at the exam centre. The exam pattern is Multiple Choice Questions (MCQ) with 200 questions divided in 5 sections. The result for NCHM JEE is announced in the 3rd week of May by NCHMCT. The students are allotted college on the basis of their rank in the exam. Further NCHM Counselling is also done for the students to understand things. Facilities The Institute provides well-equipped labs, kitchen to the students for better learning and training. The kitchen system is divided into three parts. Basic training Kitchen, which is for the first year student to have basic understanding of kitchen. Second is Quantity Training Kitchen for second year students to understand and learn cooking practically. And last is Advanced Training Kitchen, which is for final year students that is used for advanced teaching and training for international Cuisines like Chinese, Italian etc. It also provides equipped labs and library to students for better learning of their subject. Hostel facility is also provided to the students separately for boys and girls. Apart from this students can also get latest updates about the courses, their fees from IHM, Gwalior website. Further any more information regarding books, syllabus and details about NCHM JEE can be obtained from Success Mantra website.